The only book on the market to consider writing skills in the context of social work. 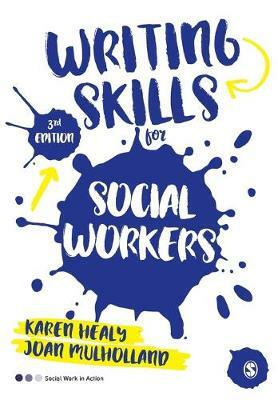 Social work students are required to communicate in writing across a variety of practice methods and contexts and this book has been designed to help them develop the skills to do this with confidence during their qualifying degree and throughout their professional career. The book covers a wide range of writing skills, including writing up case-notes, report writing, writing proposals, completing a literature review, writing journal articles and successful funding applications. New content includes: * new material on confidentiality and the use of encryption * reference to recent changes to regulation and new material on the pressures of staying up-to-date with new technology * extended coverage of collaborative writing and group working skills * up-to-date references, further reading and links to professional standards and CPD. Professor Karen Healy is a social work educator and researcher based at The University of Queensland, Brisbane Australia. She has written five books in the field of social work including works on theory for practice and social work methods and skills. Professor Healy has also written numerous journal articles in a broad range of social work and social policy topics including: professional practice; international comparison of child welfare systems; workforce issues and professional recognition. Professor Healy conducts professional writing workshops with social workers and is involved in research and evaluation of social work practice and social policies. Associate Professor Joan Mulholland has researched and taught at the universities of London and Queensland over a long period and is currently an Honorary Researcher at the School of English Media Studies and Art History, University of Queensland. She has published on language skills in a range of practice such as business, health and social work, and on the persuasive tactics which can help all professional writers and speakers achieve their goals. She has always been concerned that, in the changing world of professional practice of all kinds, people can enhance their communication efficiency with the range of different people they will meet in their working lives.